This show is already breaking my heart. How is that possible? I was supposed to have long happy arcs to build up my love for all the characters so that it could then break my heart. Isn't that what Hikaru no Go did? They took two thirds of the show before breaking up the golden triangle. Chihaya Furu is already at that point and I'm surprisingly sad. This means I've become very attached to the three primary characters in such a short time. I knew I liked the characters in this series but my closeness to the trio snuck up on me. After all, it's been - what? - half an episode? How big is this man? This episode begins with the trio visiting the local Karuta society. This series emulates Hikaru no Go so much. The Karuta society reminds me a lot about the Insei academy because of the chemistry between the students. After being smothered with love by the head teacher of the society, Arata and Chihaya challenge a team of three to a group match. Taichi has no choice in this matter because their collective passion outweighs his rational thinking. I can understand Taichi's annoyance at this scene; Arata and Chihaya are excited about the same thing, making them closer, and he is being swept away in the undercurrent of their enthusiasm. Taichi likes control and I largely believe he crushes on Chihaya so much because she is a free spirit he can't influence. Arata is a natural manipulator. Let's hope he never realizes it and becomes scheming. Arata strategizes for the three-on-three match by giving Chihaya and Taichi cards. 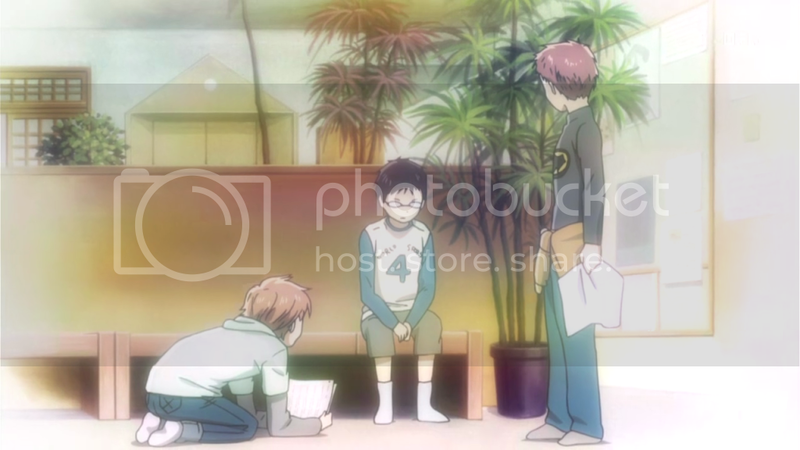 He gives Chihaya the very simple cards and Taichi the longer cards which require more listening time. Taichi questions the need for a three-on-three game when Arata can wipe the floor with most of the students who practise at this society. 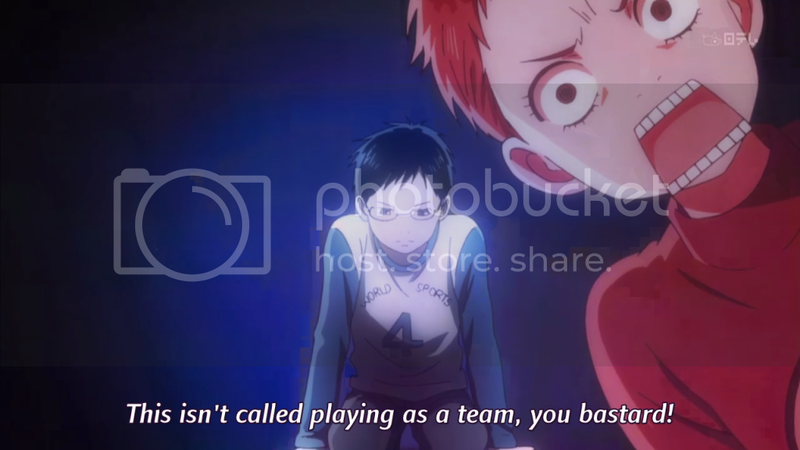 Arata confesses that a team game would be more fun. This would have been the cutest scene of the episode, but it gets trumped later on. Jealousy is always cuter than shyness. You're on the same team guys! During the match, Arata basically carries the team. He steals cards that are assigned to Chihaya and Taichi just to keep the score as high as possible. For a moment I thought he was being obnoxious and trying to prove to the room that he could beat them in a three-on-three match with two handicaps. But it soon becomes blatant that Arata even regards his teammates as opponents if victory is at stake. The match soon degenerates into a competition between Chihaya and Arata. 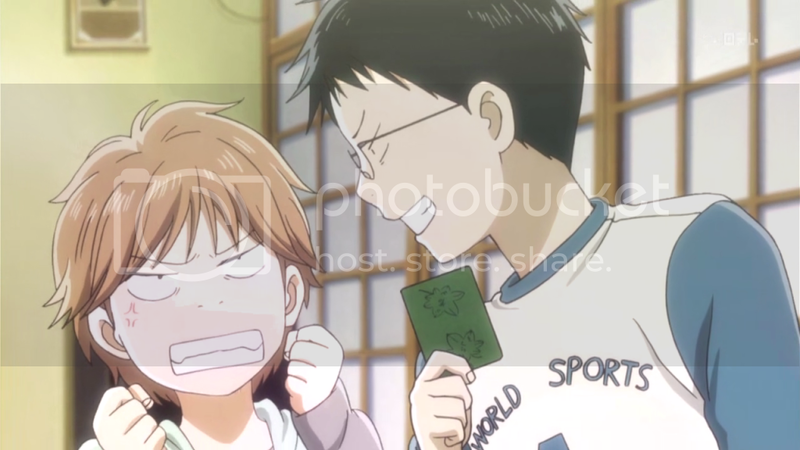 Chihaya is irritated that Arata is faster than her and tries her best to steal her card. We see another glimpse of her raw Karuta talent (more commonly known as super-keen hearing) which in turn fires Arata up. Yes there is Taichi! Chihaya won't notice you until you do! Gambatte! 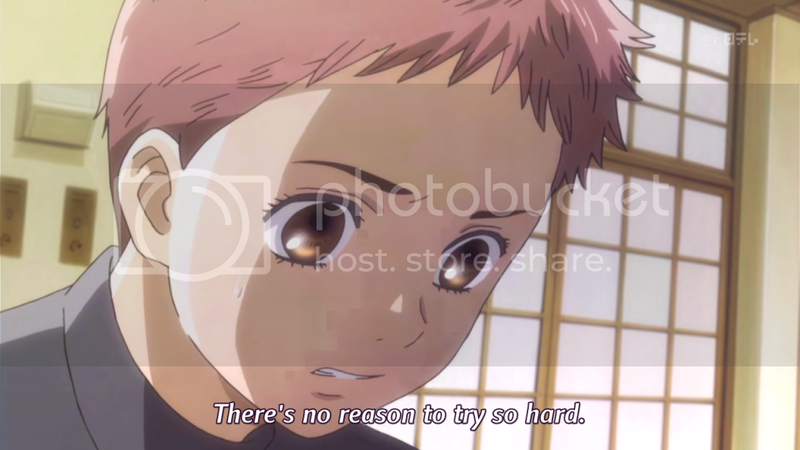 During this competition between Chihaya and Arata, Taichi wonders why she is trying so hard when Arata basically has no expectations of them. This is where Taichi realizes the happiness of doing something for himself instead of pleasing others all the time. This is an important lesson taught to Taichi indirectly via Arata. Self motivation is essential to personal success. This takes us to the end of the match, won by the Arata-Chihaya-Taichi team. The three of them sign up for the Karuta society and begin preparation for a team tournament around graduation time. It's okay Chihaya, I would want both of them too. Well, if they were at least a decade older. This is where the story takes it's turn. Chihaya is further propelled towards Karuta. She tells her sister that it's her dream to get better at Karuta. Simultaneously, Arata welcomes his news-bearing father home. The three meet at a park and have a snow fight. 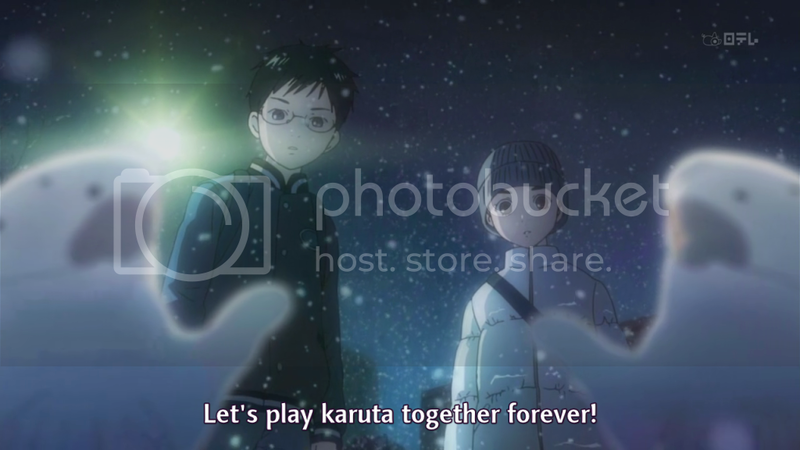 Arata finally tells Chihaya to call him by his given name when they both fall into the snow. Taichi adorably ruins their mood by butting in and informing Arata that the same rule applies for him. Although Arata sees Taichi as a rival on matters regarding Chihaya, he is happy to have such a close boy friend. They bond more than expected over their mutual unrequited crushes. Sigh, even Arata's social dysfunction is cute in the realm of Karuta. He was raised to be such a Karutabot. And then the waterworks begin. Taichi gets accepted into Kaimeisei Middle School. (I guess so far they've been in the elementary school timeline.) 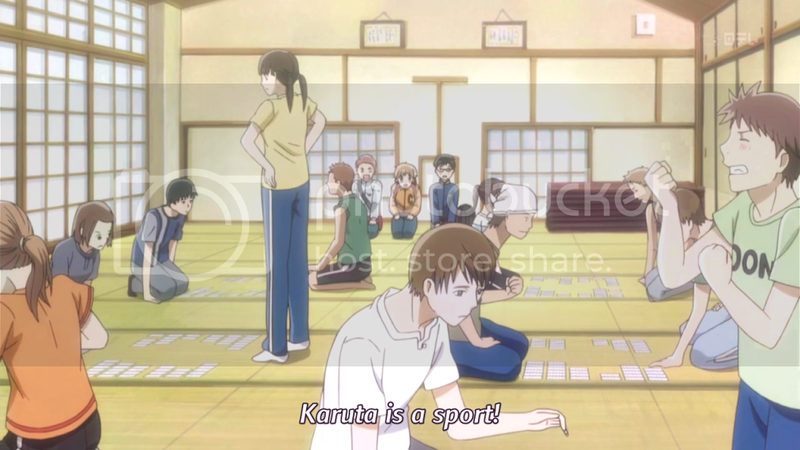 The school is an hour and a half commute which will leave no time for Taichi to play Karuta in middle school. And when it rains, it pours. 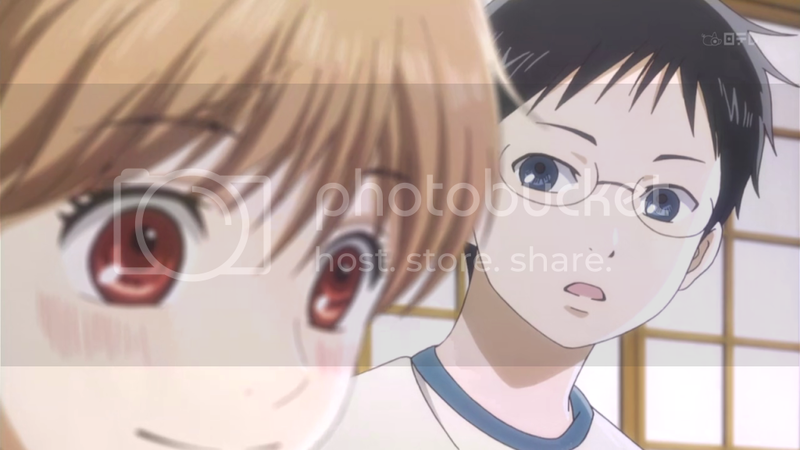 Arata tells Chihaya he is returning to Fukui after graduation because his grandfather is in the hospital. 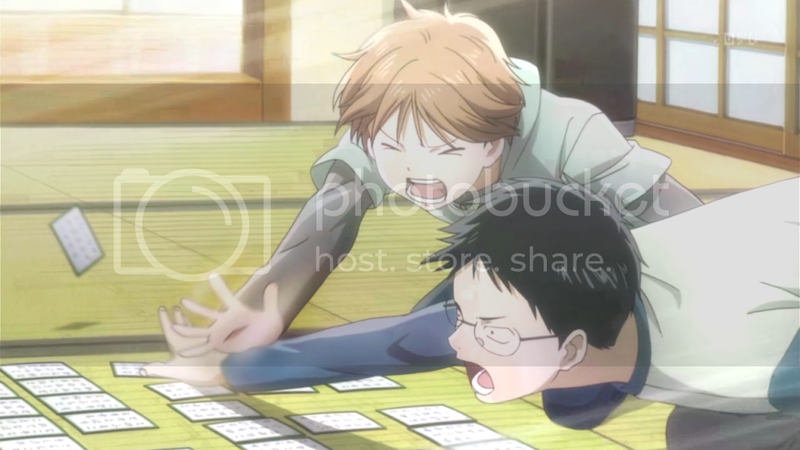 Chihaya becomes upset with the both of them and stops playing Karuta. She stops attending the tournament practise sessions. Boys... Aaro, were you this cute growing up? 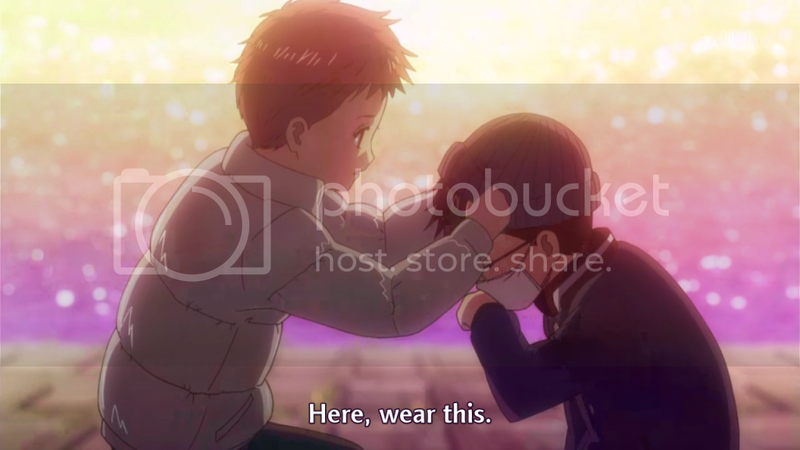 For me the cutest scene was the boys fighting over who hurt Chihaya the most. Each wants to be the reason why Chihaya stopped playing Karuta. It's such a childish sentiment and it is very well captured in the well executed scene. On the day of the tournament, Chihaya decides to play after receiving a team shirt from Arata and Taichi. Their team name is Chihaya Furu (sooriginal). They do not win the tournament. I really want to say "they do not win the tounament this time" instead, but I have an inkling we're not going to see Arata play Karuta for a while. The episode ends with tearful goodbyes. I have a lot of questions about the direction of this series. In Hikaru no Go the "goal" was always the Hand of God and while it was not achieved over the series, significant progress towards it was made. What is the goal for Chihaya Furu? It could be many things right now. Chihaya could aim for the title of Queen. I think this is too single minded while the series so far has been very team oriented. It could be something like the Hand of God, but I imagine perfect games are not foreign concept given the rules. Maybe the end is to come full circle and finish what they started - win a three team tournament as Team Chihaya Furu. I'd really like to know. Ah~ puppy love. How I'll miss thee. I'm also slightly apprehensive about the potential for emo-turning here. Everyone's separated and I don't want excessive moping over the fact. It will take away from the sadness I already feel by hammering it in too forcefully. I also have an inkling that something like the death of Arata's grandfather and its subsequent grief will push him away from Karuta. I really do hope such cliches are avoided all together or at the very least minimized on screen. I have a sinking feeling I'm already rooting for Arata in this love battle. I suspect the next episode will return to the high school timeline. 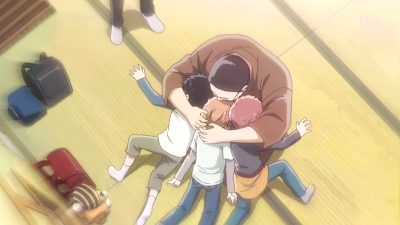 This little three episode arc took it's time in developing Chihaya's love for Karuta. I really liked that they did not cram it all into one 5 minute revelation. It was well paced and enjoyable to watch. While I wish we could have stayed in this timeline longer, without Arata the episodes will be unbalanced. I really wish there were previews to confirm my suspicions. I'm still doing well at resisting the manga to find where this series is going and whether the shojo component of it will eventually ruin it. So far, the shojo is very nicely executed and I'm hoping that this standard survives the series.